Glenridding, situated on the shore at the southern end of Ullswater, is set in some of the most beautiful countryside of the Ullswater and Patterdale valley. Surrounded by wonderful fells no wonder Glenridding is popular with mountain walkers Helvellyn, England’s third highest mountain, and many challenging peaks can be walked from here. Glenridding provides ample accommodation including camping, youth hostels, self catering cottages, guest houses and hotels and also a good range of local shops, cafes, restaurants, a pub the Travellers Rest and two hotels with bars; the Ratchers Tavern attached to the Glenridding Hotel and the Ramblers Bar attached to the Inn on the Lake Hotel. The Ullswater Steamers who run regular trips across Ullswater to Howtown and Pooley Bridge and the Glenridding Sailing Centre who offer boat hire and sailing tuition are also very popular. The village and surrounding area was used to film the TV series The Lakes. Greenside lead mine, located up a steep and winding track above Glenridding is the site of the largest lead mine in the Lake District. Lead ore was discovered in the area around Nick Head in the 1650’s and the site was mined from the 1690’s to 1962. The mine was still working when Wainwright was preparing his book, Pictorial Guide to the Lakeland Fells. Since the 1970’s the site has been owned by The National Park Authority who have been trying to stabilise some of the tips to stop them sliding down the hillside and also making sure the water from the underground workings does not pollute surrounding water courses or Ullswater Lake. When the mine closed down a lot of the buildings were demolished and the few that remained are now used as youth hostels by schools and other visiting groups. Without the mine the houses and economy of Glenridding and surrounding area would not have existed. Helvellyn at 950 metres is the highest point in the Helvellyn range and is the third highest mountain both in England and the Lake District. The Helvellyn range runs from north to south between the lakes of Thirlmere and Ullswater. Helvellyn its self is a very popular mountain to climb due to its easy access and exhilarating scrambles up and down. The summit of Helvellyn is a broad plateau running for about a kilometre between Lower Man, a subsidiary top about 700 metres to the north west, and the start of Striding Edge. It is so smooth and large that a small plane was able to land on it in 1926 and there is a stone tablet monument 40 yards south of a cross shaped stone shelter commemorating the aeroplane landing. The views from the summit are magnificent and on a clear day the views extend across the whole of the Lake District and beyond. The scenery is stunning on the approach to Helvellyn’s eastern side with its three deep glacial coves, a small tarn and two sharp topped ridges, Striding Edge and Swirral Edge. The western flanks drop gently at first then more steeply down to Thirlmere. Striding Edge begins at Hole-in-the-Wall and then stretches for over 1.5 km linking the summit ridge of Birkhouse Moor to the summit of Helvellyn and involves some steep scrambling and 80 meters of rough rocky terrain. It is a notorious accident black spot among hikers and scramblers. 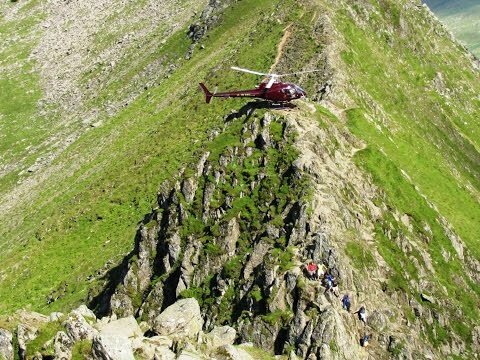 Swirral Edge beginning at Red Tarn is a shorter route which also involves scrambling and is also another accident black spot amongst hikers and scramblers making it just as dangerous as Striding Edge. Both edges have steep escarpments on both sides so a head for heights is needed. Between these two ridges lies Red Tarn which was formed when the glacier that carved out the eastern side of Helvellyn had melted. The small tarn lying at an altitude of 718m is about 25m deep and is one of the highest in the Lake District. In the mid 19th century Red Tarn was dammed to increase its capacity to enable it to supply power to the Greenside Lead Mine. The dam has now gone and the tarn has returned to its normal size. It contains brown trout and schelly, a species of white fish found in only four bodies of water in the Lake District. It is fed by a number of streams and flows outwards into Glenridding Beck which then flows alongside Greenside Road into Glenridding Beck then Ullswater. Many people do camp on Helvellyn often near Red Tarn even though camping in England is illegal without the permission of the landowner. There is a tradition of wild camping in the Lake District and as long as people camp unobtrusively for no more than one night and leave no traces of their site a blind eye is taken. Since the last ice age, on the rock ledges high on the eastern slopes, arctic alpine plants grow in small clusters. Mountain birds and Britain’s only alpine butterfly also live on and around Helvellyn. If you are nervous of heights and narrow ridges and do not wish to take in Swirral Edge and Striding Edge then follow this walk to Red Tarn and take the clearly visible path to the left which leads to the Hole-in-the-Wall then continue with our walk. From the tourist information centre we make our way to the end of the car park and turn right and go through the opening signposted Helvellyn via Greenside Road. We turn left and follow Greenside Road past the Travellers Rest and two rows of cottages on our right. We keep heading forwards with Glenridding Beck on our left until we come to the YHA. We cross the bridge over Swirl Beck and go through the gate. We head forwards then turn right signposted Brown Cove, Whiteside Bank and Sticks Pass and then left. We head forwards and follow the yellow arrow for Red Tarn and Helvellyn. We cross the footbridge over Glenridding Beck and turn right. We now follow the track with the beck on our right. After crossing the second small footbridge we start to bear left following the stream on our left uphill until we come to Red Tarn. We now take the path on the right of the tarn and make our way uphill to scramble up Swirral Edge to the top of Helvellyn. At the top we turn left and walk along the flat plateau past the trig point and a cairn. We now start to go downhill towards Striding Edge. On reaching the big rock face we scramble to the top then down and at the next big rock we take the path on the left of the ridge of Striding Edge which is very narrow ledge in places (if you wish you can take the path over the very top of Striding Edge). As we drop down we keep following the path heading for the wall in the distance. At the wall (Hole-in-the-Wall) we follow the track with the wall on our right. When the wall turns right we head straight forward and keep following the path as it bears right downhill. We come to a wall and follow it downhill for a short way then we bear left and keep heading downhill following a little beck on our left. We cross a little bridge, go through a gate and then follow the track to Greenside Road. We turn right and make our way back to the car park. This is a hard walk with steep inclines and declines and narrow ledges and edges. There is a lot of steep scrambling over rocks and boulders. Approx 7.5 miles allow 5 hours using OS Explorer Map OL5, The English Lakes North-eastern area. Glenridding is in the Patterdale/Ullswater Valley in the Lake District, Cumbria. Parking: National Trust Pay and Display car park £7 for all day. There are public toilets in Glenridding next door to the Tourist Information Centre in the main car park. For refreshments there are a number of shops, a cafe and restaurant, coffee house, a pub and hotels with bars.